It’s the Sunday of the Prodigal Son. I’ve been reading some homilies on the subject, because I’m afraid I’ll miss my own priest’s sermon tomorrow because of illness. One thing that impressed me about the story was the distance factor. The son was in a far country, when he realized what he needed to do. He was hungry and wasted, but he still needed to rise and go, to travel a long way, which must have been a struggle. All of humanity is represented by the prodigal son, and most of us are still on the journey. Some of us have repented and are a bit farther on our way, but we are all clothed in our flesh, struggling with our sins, anticipating the day when we sit in the Kingdom and feast with our Father, enjoying the restoration of our full inheritance. I’m afraid I often act a bit nonchalant, as though I am at the gate or even in my Father’s arms already. My initial coming to myself has to be followed up by a constant facing-up to the toil of the road. Maybe I have been sitting on the grassy shoulder wishing the trip weren’t so long, wondering if maybe someone will arrive and carry me the rest of the way. Na perastika! Which, in Greek, means, “May it [the illness] pass! And quickly, too. We are going to miss church on account of the SNOW. It'll be three more days before we will get to go anywhere. What good stuff you have shared with us. Thank you, I'll be pondering it tonight. I keep waiting for someone to carry me, too! Did you get my e-mail about the book/s? If not, let me know and I'll resend or just post it as a comment. 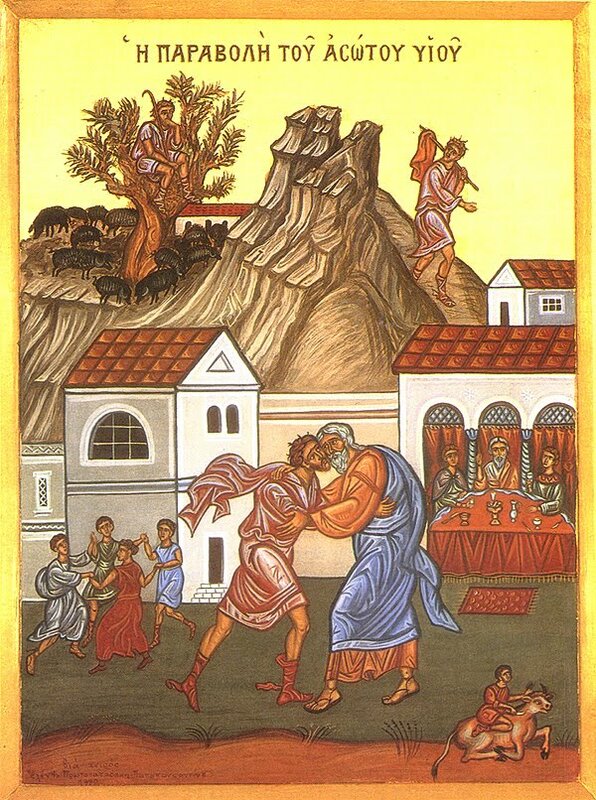 Also, as a side note, there is a beautiful fresco painted by Ben Long of the Parable of the Prodigal in Montreat College. (North Carolina). It's outstanding if you ever have the chance to see it. Your thoughts reminded me of the story of the turtoise and the hare. Sometimes we must be so much like the hare, thinking we're doing just fine but rather we're being thrown off the race. I'm so glad to have been able to read this. I was baptised on the Sunday of the Prodigal Son so the call to turn back to our Father each year is always a very personal one for me, and well needed this year.